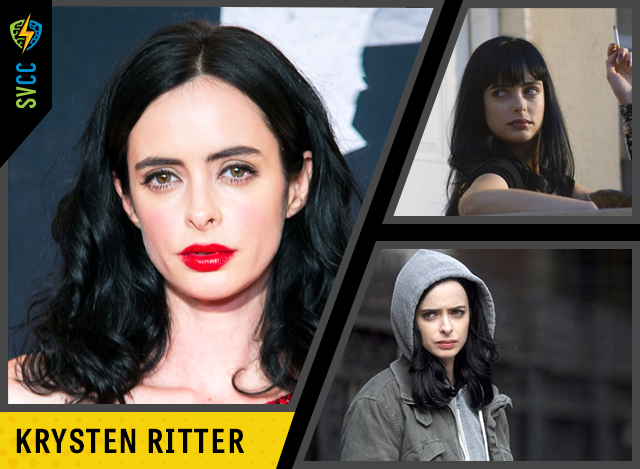 KRYSTEN RITTER is known for her starring roles in the award-winning Netflix original series, Marvel’s Jessica Jones, also Defenders, and cult favorite, Don’t Trust the B—- in Apartment 23, as well as her pivotal role on AMC’s Breaking Bad. Krysten’s work on film includes Big Eyes, Listen Up Philip, Life Happens (which she co-wrote), The Hero, Confessions of a Shopaholic and She’s Out of My League. She is also the founder of Silent Machine, a production company which aims to highlight complex female protagonists. Krysten’s critically acclaimed debut novel BONFIRE is out now and available wherever books are sold. In her spare time, Krysten is also an avid knitter and has a collaboration of knitting kits available from WE ARE KNITTERS. Sunday Only – Purchase your autograph here! Sunday Only – Purchase your photograph here! Sunday Only – Jessica Jones Photograph Package with David Tennant and Krysten Ritter – Purchase here!